This post could alternatively be titled – Dream Big Dreams Because YOU Can Make Them Happen! or Don’t Stop Your Daydreaming or a million other titles that have to do with thinking outside of the box, dreaming, thinking big things, not doubting yourself, finding yourself the best girl squad ever, just finding yourself in general, doing something bigger than yourself, etc. You get the idea here! Last month I, along with co-founder Taylor of e-commerce brand Tailor, pulled off an amazing feat! 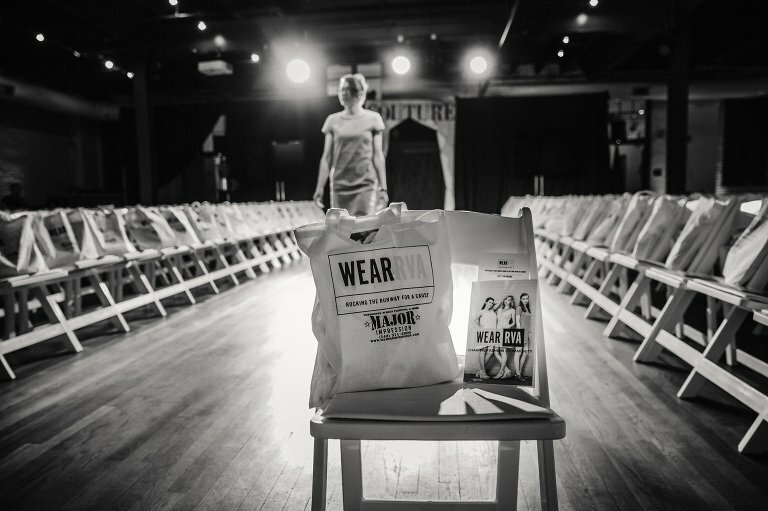 On May 10th at 6:30pm WEAR RVA – Rocking the Runway For A Cause hit the runway with smashing success!!!! 42 teen models from the RVA area rocked clothing from 7 locally owned boutiques and 1 amazing fashion designer. 16 hair and makeup professionals perfected their looks for the runway and over 25 locally owned businesses came together to make this show spectacular. Quite honestly I had been mulling around the idea of a fashion show for awhile- maybe 2 years”ish”. My photography specialization has been leaning toward high school senior photography since I moved to Richmond. (Check that out here at Amber Kay Seniors). I love working with teen girls and I absolutely adore watching them transform in front of my camera. They gain so much self confidence from feeling beautiful and seeing themselves as beautiful. I create gorgeous photos of gorgeous girls but what I also do is to help them see themselves as beautiful! Every year I have what I call my Senior Squad. It’s a group of senior girls or uprising senior girls that I work with the whole year. (So there’s Senior Squad ’18 & Senior Squad ’19 right now). We have fun styled photo sessions, get to know one another, build each other up, and create a “no mean girl” environment. My goal is to help them see themselves as the amazing beings that they are, exactly as they are right now and then also to empower each other. The girls build each other up & support each other. Squad is for all girls and isn’t chosen based on anything other than if the girls want to participate. My first thought was that I wanted to create a fashion show that my Senior Squad girls could model for. A super fun part of being on Squad! Quickly the idea grew beyond that. I saw a hole in the both the fashion show and teen industry and I wanted to help to fill that. I wanted this fashion show to feature ONLY teen girls as models & I wanted it to empower these girls to see themselves as beautiful, as worthy, as enough. I wanted to create an environment so much bigger than my Senior Squad where these girls would support each other, build each other up, and bring out the best in each other. We see so many examples in the media of how girls should look (skinny, tall, no acne, etc) and hear so many stories of the “mean girl mentality”. I wanted to prove to these girls that they are so much stronger together, that women support women. I wanted to get rid of the term “real girl” because ALL GIRLS ARE REAL. No matter your size, height, shape, ethnic background, skin color, hair color, religious identification, etc you ARE REAL. My Senior Squad girls were offered first chance to participate and then we opened it up to all teen girls in the Richmond area. No model experience necessary. The only requirement was that the girls had to be a current high school student, had to be available on a few key dates, and had to have parental permission. I knew that in order to pull this off I needed help! I needed someone with some insight into the fashion world, with some fashion show experience, and most of all I needed a woman who could see my vision and believe in as much as I did. Enter Taylor! I met her at an RVA fashion blogger and business woman’s happy hour. We were introduced by a mutual friend and it seemed like a really good connection. Taylor was friendly and definitely knowledgeable in the fashion arena so I pitched my idea…within 5 minutes of meeting her. We both laugh at that now! Needless to say Taylor was a yes and we set out planning WEAR RVA right away. We sat down for our first planning meeting and hammered out as many details as possible and I walked away knowing that I had made an amazing new friend. As we planned we knew that we wanted to create an event that was bigger than us. Yes we had our mission statement of empowering girls but bigger than that we wanted to raise money for a charity so that our girls could also see that we were invested in them, in our community, and we wanted to lead by example. The idea was to have a community based event- local businesses coming together to support each other, to support the girls of our community. I’d be lying if I said that we didn’t have a few hiccups and if we didn’t feel like we were in over our heads at times. I was so worried that something would fall through and that our vision of an amazing production fashion show would fall flat. We pulled this event together with little to no budget and that was very scary. All of our initial calls & emails to potential businesses to come on to the event were like “hey we have this amazing idea and event we’re putting together. We would love for you to be a part of it and we would love for you to do it as a sponsor. We have no budget to pay you.” Ha ha. Needless to say we were turned down plenty of times! Next year we will be seeking corporate sponsors much sooner that is for sure. Another concern was that since this was a debut event that perhaps nobody would take us seriously. What would happen if we didn’t sell any tickets? What if nobody came? That was my own insecurity talking of course. We sold out of our vip tickets in less than 48 hours and we were sold out of tickets completely 2 days before the event! Media coverage greatly helped with this too! We were lucky enough to get a spot on WRIC ABC Chanel 8 morning news for an interview. That was so exciting! You can watch our full interview HERE. The Richmond Dispatch Times also gave us an amazing write up both online and in the paper. You can read that article HERE. Taylor and I and so many others worked tirelessly for months to pull this off! The evening of the show it was all I could do to hold it together. (I have a tendency to be a bit of a crier.) Taylor and I walked out on stage to welcome everyone and I was so completely overwhelmed by all the support and all the love. 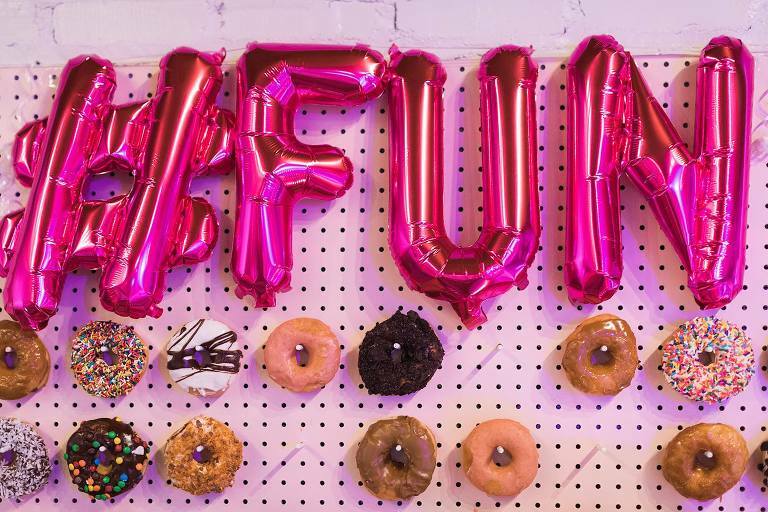 The runway, the lights, the chairs, the donut board, all the lovely guests….it all looked so incredibly beautiful! It was pure magic watching our girls strut their stuff down the runway. Watching their transformation from shy and unsure to Super Model Confidence was worth every single night of only a few hours of sleep. We had a couple of practices for the girls to show them how to walk the runway, pose, exude confidence, etc. I remember at the very first practice one of the models called me over to where she was in line. She whispered “Amber, help, I can’t do this. I really don’t think I can.” I half laughed with her, gave her a hug, and assured her that she could do it and reminded her of what a rockstar she is. On the night of the show I watched her strut her stuff down the runway like she had been walking New York Fashion Week for years. She was so confident with her held held high. A total super model!!!!! And I cried a little, again. All of our girls were so amazing and the confidence they walked with on show night was so amazing. I wish everyone could have seen their growth like we could!!! I can’t possibly forget to mention all that was taking place behind the scenes! So many amazing people were running around behind the runway making sure this show was spectacular. Shouts out to all of our amazing hair and makeup artists, designer, boutiques, support staff, photographers, videographer, models. I learned so many things creating, planning, & executing WEAR RVA. Fundraising. Event planning. Event organization. How to write a press release. How to look somewhat fashionable in a room full of fashionistas. + so much more! When you create or do something that is much bigger than yourself what you gain from it (that you weren’t expecting) is so much bigger than you could ever have even dreamed up. 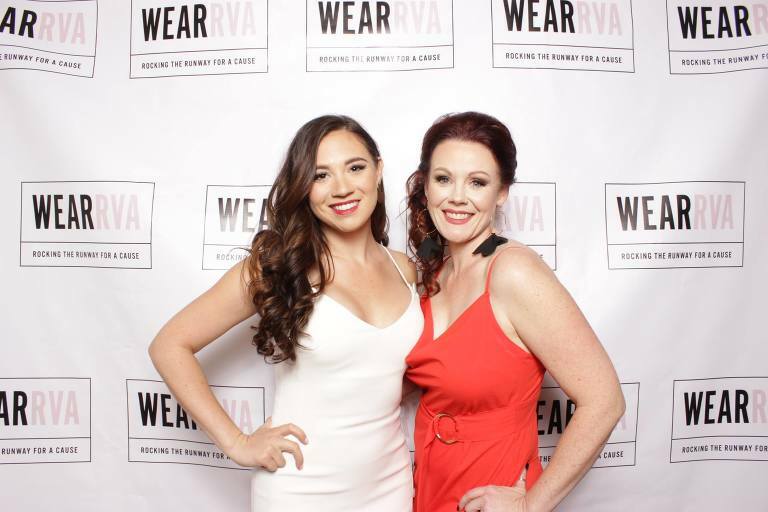 Putting together WEAR RVA was about empowering the young women of our community & raising money for scholarships. It wasn’t about me at all. By happenstance though I was stretched & grew leaps & bounds. I gained a greater sense of confidence than I ever thought I could have, I gained amazing new friendships, I gained the knowledge that I can do big things, & my heart is the fullest it’s ever been. I’ll be honest…I never got into this thinking that somehow I would find My Squad. I never thought that I wanted one or that one even existed for me. I also never thought that maybe…just maybe…I’d meet the one woman out there that I’d mesh with and that we would create magic together. WELL I stand corrected! Taylor and I just work together. Our personalities mesh, our delivery style works, work ethic, attention to detail, etc. She has helped to build my confidence and prove to me that we can do hard things. She has supported my dream and visions and helped to make them come to life. She has proven to me that we are stronger together and that women support women and build each other up. I cannot possibly thank her enough for her friendship and support. So here’s to doing big crazy things! Here’s to stepping outside of our comfort zones! Here’s to making new friends and building new squads! Here’s to women empowering other women! Here’s to not taking no for an answer! Here’s to being brazen woman, the ones who don’t hide behind the status quo, the ones who step out into the world and make their dreams come true. I’m so very proud to say that WEAR RVA was able to raise over $5,000 for The Network of Enterprising Women’s scholarship fund! Taylor and I presented the check to them last week at their June luncheon. Make sure you check them out and join them for a luncheon or two. They’re an outstanding group of women doing awesome things. Thank you to all of our awesome Boutiques & Designer that participated- Tailor, Simple Soul, Free Reign, Evolve, The SEE Boutique, Firefly Lane Boutique, Stitch by Chanel, Trunk Up .